Eric Cantona has been voted the greatest Premiership player of all time following a survey commissioned by the the league's sponsors, Barclays. The former Manchester United forward won 17% of the vote to top the first Premiership Global Fans Report which analysed the opinions of 26,000 fans. Arsenal's Thierry Henry was voted the best current player, while Chelsea's Jose Mourinho was voted the best boss. Old Trafford was rated the best ground in the Premiership. 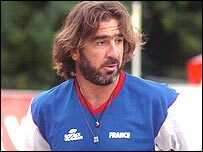 Meanwhile, Cantona, 39, believes his efforts in helping France win the beach soccer world championship earlier this year, was as important as his successes at Old Trafford. The Frenchman, who retired from football in 1997, is player-coach of the national five-a-side beach football team. "Emotionally for me winning at beach soccer was just the same as winning for Manchester United," he said. "When we won I cried, it meant so much to me. I was very proud. "Of course it is not as big as football but when you are a rich man you are proud to own a Rolls Royce and when you are a poor man you are proud to own a Renault. "I love being at the start of something and watching it grow."